Vikingsholm Castle is open for tours during the summer months. 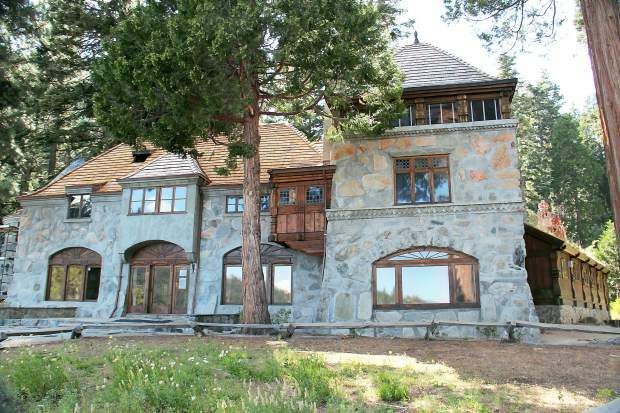 Lora Josephine Knight’s legacy is enshrined in the magnificent Scandinavian castle “Vikingsholm” that she had built at Emerald Bay in 1929, but her first property at Tahoe was actually located at Chinquapin, a sheltered cove just east of Dollar Point in Carnelian Bay. Eight years before her marriage to Harry Knight, Mrs. Josephine Moore purchased the land at Chinquapin from descendants of Lake Tahoe timber baron Duane L. Bliss. It was there in 1914 that Moore built a charming lakefront estate that she called Wychwood. In 1873, engineer Alexis Von Schmidt recommended the site for the proposed James Lick Astronomical Observatory that would house the world’s most powerful space telescope. James Lick, a Pennsylvania Dutchman, first struck it rich in the California Gold Rush and then parlayed his luck into a fortune by investing in San Francisco’s booming real estate market. A curious man, Lick had always been interested in astronomy. By the 1870s Lick was in poor health, but still fiercely determined to build the observatory. Astronomers suggested that a high-altitude mountain location above atmospheric dust and away from city light would be the best location. Von Schmidt chose a site 300 feet above Lake Tahoe on the Chinquapin point, renaming it Observatory Point in anticipation. Many communities were interested in Lick’s $2 million estate and several protested the Tahoe location insisting that they were better suited for an observatory than the snowbound lake. Lick leaned toward Von Schmidt’s recommendation, but the dying benefactor designated a committee to make the final decision. After years of bickering, the Lick Observatory was finally constructed in 1888 on Mount Hamilton east of San Jose. It was the first permanently occupied mountaintop observatory in the world and for nearly 10 years its telescope was the largest ever built. Lora Small (Knight) was born in Galena, Illinois, in 1864 of English descent. Her father, Edward Small, was a corporate lawyer who took on two brothers as partners in his law practice — William Henry Moore and James Hobart Moore. As fate would have it, Lora married James and her sister Ada married William. After Edward Small’s death, William and James took over the firm and formed the Moore Brothers partnership. The sibling entrepreneurs eventually amassed quite a fortune with controlling interest in a number of large American corporations such as the Diamond Match Company, U.S. Steel and National Biscuit (Nabisco), the maker of Oreo cookies. In 1884, Lora gave birth to their only child, a son Nathaniel, who later married Helen Fargo, heiress to the Wells Fargo banking dynasty founded in San Francisco during the Gold Rush. “Nathan” was an avid golfer and a participating member of the American Olympic team that won the gold medal at the 1904 Summer Games in Missouri. Nathan Moore apparently knew how to have a good time, dying at the age of 25 of “natural causes” after spending the previous night at Chicago’s most famous and expensive house of prostitution. His nationally reported death led to a crackdown on Chicago brothels and morphine abuse. Lora and her husband, James, traveled extensively in California as to foreign countries. They also spent time at their luxury homes in Illinois and Wisconsin. Their Wisconsin chateau boasted 27 rooms, a wine cellar and a two-lane bowling alley. The horse stable housed 60 thoroughbreds. Life was good for the Moores, but after their purchase of the Tahoe property, James’ health began to fail. In early 1916 they bought a home near Santa Barbara hoping that the mild Mediterranean climate might improve his condition, but he died on July 20, 1916, leaving Lora an estate worth $15 million. In 1922, Lora Moore married Harry French Knight, a stockbroker. Unfortunately, they were not happy together and divorced after just a couple of years. Although their marriage was short-lived, Lora and Harry Knight were among the small group of St. Louis, Missouri, businessmen who were the principal financial backers of Charles Lindbergh’s famed 1927 flight across the Atlantic from New York to Paris. Lindbergh approached the Knight’s about helping fund his effort to be the first to fly nonstop across the Atlantic at a St. Louis airfield where Harry, an aspiring aviator, was taking flying lessons. They agreed to be major supporters. In later years, Charles Lindbergh frequently visited Lora Knight at her Santa Barbara estate and the Vikingsholm castle as well. Lora had a life-long reputation for her generous hospitality, philanthropy and numerous financial contributions to youth groups in California and Nevada. Knight loved Tahoe, and for 16 years she enjoyed her summers at Wychwood, hosting friends and family members, but in 1928, she sold her beloved lakeside Shangri-La to Robert Stanley Dollar Sr., a wealthy San Francisco businessman. Lora then purchased about 240 acres of land at the head of Emerald Bay, as well as Fannette Island, from the William Henry Armstrong family for $250,000. Knight had become acquaintances with the Armstrong’s through church affiliations and after the purchase she would build her majestic Vikingsholm the following year. She then commissioned Lennart Palme, a Swedish architect to whom she was related by marriage, to design Vikingsholm. Apparently, she chose the Scandinavian motif because she had admired Palme’s own Scandinavian-designed home in New York. Emerald Bay also reminded her of a Norwegian fjord with it steep surrounding slopes and deep blue water. Palme and Knight traveled to Scandinavia that summer to research the design features that would be incorporated into her Tahoe castle. They visited Denmark, Finland, Norway and Sweden as they inspected buildings dating back 1,000 years. Construction on the castle began in the spring of 1929 and proceeded quickly as 200 workmen and artisans, housed in temporary barracks, quarried nearby stone and cut lumber. Support timbers were hand hewn and interior wallboard meticulously hand planed, while metal fixtures like fireplace screens, hinges and latches were hand forged on-site. Finnish carpenters were then brought in to hew timber, while a Scandinavian craftsman was hired to create the intricate exterior wood carvings. Knight had derived design ideas from 11th century wooden churches in Norway and carvings from these ancient church entrances were incorporated into many Vikingsholm door entries. Pieces of wood resembling spikes adorn the gutters in a nod to the Scandinavian custom people used to ward off evil spirits. The roof of the north and south wings is topped with sod where grass and flowers grow each spring. Carved dragon heads are common as both interior and exterior decorations, as they were used in old Viking castles to divide the main room between the chieftain and his most honored guests from the women and children. Lora Knight filled her castle with original antiques she picked up in Scandinavia. Sometimes government officials did not allow these native heirlooms removed from the country, so Knight had craftsmen reproduce them in exact detail, including the aging of the wood and even mimicking scratches on the originals. Despite its ancient motif, Vikingsholm had all the conveniences available in the 1930s, including electricity, modern fixtures and private baths in the bedrooms. She exhibited Indian baskets, including some by the noted Washoe weaver Dat-So-La-Lee, also known as Louisa Keyser. There was a boathouse for Knights’ largest boat, a beautiful mahogany cabin cruiser named the Valkyrie. During construction of the main house Lora turned her attention to Fannette Island in the middle of Emerald Bay. She had a granite teahouse that resembled a small castle built on the crest of the island. The locally quarried granite boulders were ferried by barge to the island where derricks lifted them stone by stone. Despite the expense and effort, the tea house was rarely used, even though Lora spent all her summers at Vikingsholm until her death in 1945. There is a single-lane dirt road that connects Vikingsholm with Highway 89. Mrs. Knight had it graded in 1929 for $10,000 so that she and her guests could arrive by automobile. Currently it is used as a hiking trail by those wishing to visit this remarkable castle. Architect Palme estimated the project’s total cost at $500,000. Today, Lora Knight’s Viking castle is considered perhaps the finest example of Scandinavian architecture in North America. Vikingsholm is administered by the California Park System. Those wishing to know more can enjoy one of the daily guided tours from Memorial Day weekend until the end of September.